Christine began her career in the financial services industry in 2008 with Edward Jones. During her five-year career there, she received several professional achievement awards. In March 2013, Christine began Lanai Financial Solutions which provided her greater flexibility and increased investment solutions to provide more personalized financial solutions to fit her clients’ needs. Christine is passionate about taking a topic that can be difficult to understand and breaking it down into pieces that her clients can understand so they can be an active participant in their financial plan. Christine is Series 7, 9, 10 and 66 licensed and holds the Accredited Asset Management Specialist designation. Christine is licensed in the following states: Alabama, Arizona, California, Florida, Massachusetts, Michigan, Missouri, Nevada, New York, Oregon, Pennsylvania, Texas, Vermont, Virginia, and Washington. Christine received her Master’s Degree from George Mason University in Washington DC and her Bachelor of Science from Long Island University in NY. Christine currently holds a board position at Santa Cruz Montessori the school her two young sons Kingston and Beckett attend. 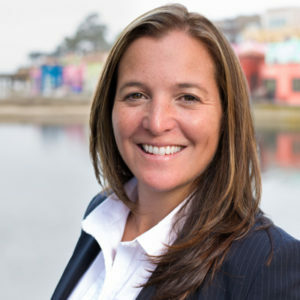 In the past, Christine has served as Treasurer for the City of Capitola as well as the President of the Board for the Capitola- Soquel Chamber of Commerce. She has also held the positions as the Chair of the Capitola Finance Advisory Committee and the Treasurer of the Capitola Public Safety Foundation. In 2014 Christine earned the honor of being named “Women of the Year" by the Capitola- Soquel Chamber. Christine, her husband Rory McBroom and children reside in Riverview Terrace, in the heart of Capitola. Their family including fur-baby “Sadie” the lively French Bulldog are often seen riding their bikes or walking in the village. In her spare time, Christine and family enjoy, swimming, traveling, cooking, skiing, and camping. This year she is most excited about teaching her children to snow ski.